Gatwick airport has announced increased profits, and increased numbers of passengers compared to last year. Comparing each month with the same month a year ago, passengers were up by 2.1% in October; up 2.4% in September; up 0.2% in August; down – 0.1% in July; up 4% in June and up 2% in May. Profits increased by 4.8% over the same April to September period in 2011. Stewart Wingate, Gatwick’s chief executive, says the airport is opening up new long-haul routes to Russian, China, Vietnam and Korea. He says the growing numbers of passengers “is why we recently announced our plans to explore 2nd runway options as we believe growth at Gatwick is the best option for increasing connectivity for the next generation.” He says there is an over-emphasis in the UK on the need for a single hub airport and London could follow a similar model to New York, which is served by 3 key airports. Rival Heathrow says the New York model wouldn’t work in the UK as there is only one major network airline in this country – British Airways – compared to three in the US. 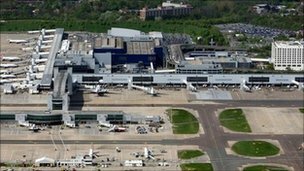 Gatwick Airport has announced increased half-yearly profits of £172m and a growth in passenger numbers. Profits increased by 4.8% over the same April to September period in 2011. Gatwick was sold in 2009 after the Competition Commission ruled BAA must also sell Stansted and either Glasgow or Edinburgh airports. He added that the airport was also opening up new long-haul routes to Russian, China, Vietnam and Korea. During the same six-month period, turnover was up by 3.6% to £325.8m and passenger numbers also increased by 1.2% to 19.9 million. Mr Wingate said: “This proves passengers are best served by allowing airports to compete. A legal agreement currently prevents a second runway being built at the West Sussex airport until 2019. In June, Gatwick announced plans to handle up to 40 million passengers a year by 2021, increasing to 45 million annually by 2030. Gatwick said about 23,000 people were employed at the airport, with a further 13,000 jobs in related businesses in the South East. Gatwick Airport has stepped up its campaign for a second runway after an increase in passenger numbers pushed half-year turnover up 3.6pc. The airport, which is trying to compete with Heathrow as a gateway to destinations in Asia, saw 19.9m passengers pass through its doors in the six months to September 30, up from 19.7m in the same period last year. Holidaymakers and business travellers also spent more while they were at the Sussex airport, helping turnover up from £314.5m to £325.8m. Pre-tax profits jumped to £107.2m from £32.1m previously. Stewart Wingate, chief executive of Gatwick, said the results were proof that competition between the various London airports was the best way of improving aviation capacity in the south east of England. Gatwick, which was bought by Global Infrastructure Partners in 2009, recently announced it had commissioned a study into a second runway. Mr Wingate believes there is an over-emphasis in the UK on the need for a single hub airport and London could follow a similar model to New York, which is served by three key airports. “Three years of competition has seen Gatwick grow its European short-haul business, whilst also opening up new routes to key markets in Russia, China, Vietnam and Korea,” Mr Wingate said. Passengers are “best served by allowing airports to compete”, he added. In New York, Newark and LaGuardia airports both compete with the bigger John F. Kennedy for passengers. Gatwick has promised to abide by an agreement with the local community which prevents it from opening a second runway before 2019, but the airport has set out its stall as a commission chaired by Sir Howard Davies assesses how to improve airport capacity in Britain. Rival Heathrow recently claimed the New York model wouldn’t work in the UK as there is only one major network airline in this country – British Airways – compared to three in the US. Heathrow also claimed New York is “less well connected than it would be” if it had a single hub airport. Posted: Thursday, November 29th, 2012. Filed in General News, News about Airports, Recent News.